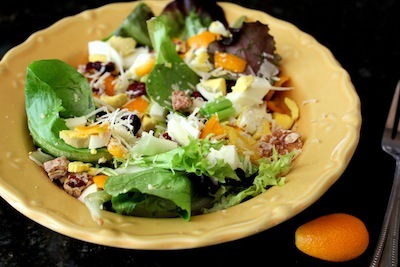 Here is an early spring salad to enjoy for a quick lunch. Early salad greens, kumquats, and green onions are ready in some gardens. I love these flavor combinations and the fact that I can snip some greens, pull an onion, and pick kumquats all fresh for the salad. You can make just one or increase the ingredients to feed several more people. Do not peel the kumquats. The sweet flavor is in the tender rind. After rinsing and drying, cut the kumquats in half, pull out the membrane and any seeds, squeeze the juice onto the greens and chop the rind and any pulp left. The pulp and juice of the kumquat is sour, the rind is sweet. 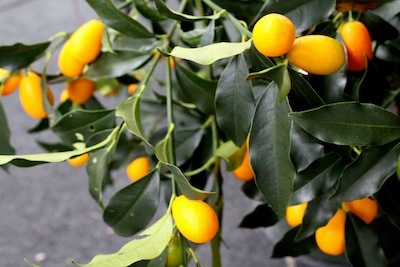 You can substitute fresh peeled or canned mandarin oranges if kumquats are not available. Toss all together and grate the Pecorino/Asiago cheese on top. You can add your favorite salad dressing sparingly. A light cream dressing like blue cheese or ranch is best. This salad really doesn’t need dressing, there are so many flavors melding together. Enjoy for a filling, tasty lunch.